We can all agree that the worst part about working out at the gym is the gym. The music is too loud. It’s always too hot or too cold. And your favorite machine is always occupied by the same super-fit guy who is way better at using it than you. You spend most of your time in the gym staring out the window at the park across the street. If only there was a way to replicate the effectiveness of a complete gym workout without actually having to set foot in a gym. In reality, every exercise machine in your local gym is just a man-made version of some activity humans have been doing in nature since the beginning of time. You can easily recreate most workout routines outdoors. You just need to know where to look. With some luck, you’ll never have to wait in line for the rowing machine again. One of the best things about moving your workout outdoors is that you end up performing motions that mirror your actual daily routine. If you spend a lot of time walking up stairs, then a workout that includes those stairs is going to produce noticeable results almost immediately. Walking or jogging up multiple flights of stairs provides a great cardio workout, but you really only need a few stairs to perform these lunch break stair jumps. Stair jumps are all about lower body power development, and the easiest variation of this is the pylo hop. Start at the bottom of the stairs with your feet shoulder width apart. Hop up one step, then back down. Do five to 20 reps per set. On your next set, jump two steps. Finish it up with a set of three-step hops. Not only does this simple exercise improve your leg strength, it’s also a great stress reliever. 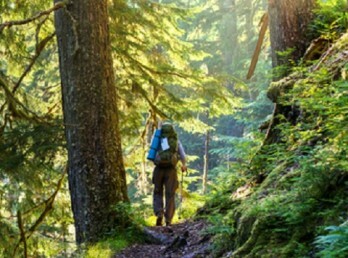 If you’re going for a hike and you’re carrying a heavy pack, then congratulations: you are already in the midst of an effective leg, shoulder and back workout. If you want to get your arms and abs in on the game, add some intervals of pullups to your hike. As you walk, keep your eye out for a sturdy, low-lying branch and use it perform a set of pullups. Then, walk for three to five minutes, find another branch and do 10 hanging leg lifts. The key to a good leg lift is ensuring that you’re using your abdominal and upper leg strength to perform each repetition. Avoid the urge to cheat by swinging your legs and letting the momentum do all of the work for you. And if you’re working out in nature, we recommend a hiking boot with a more athletic insole, like the Merrill Reflex. Not only are they lighter than a traditional hiking boot, but the cushioning is closer to that of a running shoe to help avoid injury. Whether you’re waiting for a train or waiting in line for your morning coffee, there are several great exercises you can do that utilize your body’s natural tension to help strengthen your core. If you really want to replicate the feeling of being in nature, do the standing canoe exercise. To perform these, stand with your legs spread and knees slightly bent. With your laptop bag or purse held out in front of you at chest height, start to paddle your arms by pulling them toward each hip so you feel the burn in your oblique muscles.